The words are taken verbatim from the official Chinese news agency, Xinhua. The pictures aren't. 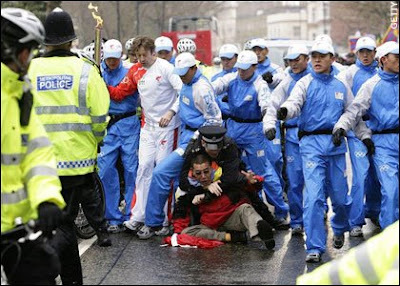 The heavy snow in London exerted slim effect on people's passion of seeing Beijing Olympic flame as large crowds lined along the street to greet the relay of torch on Sunday in the host city of 2012 Games. Dragon and lion dancing performance dressed up the Chinatown like a festival. Large groups of Chinese in squares or concentration point waited the flame hours before its arrival. "The Olympic games are very important for all Chinese. In Chinatown, everyone is very anxious to see the torch pass," said London Chinese Community Center spokeswoman Annie Wu. The Notting Hill Gate in west London greeted the Beijing Olympic torch on Sunday morning with a mini carnival reminiscent of the annual carnival that draws over one million revelers. People with families and toddlers turned out in the hundreds braving wintry snow to line the streets in Notting Hill Gate and celebrate the Olympic torch. Chinese ambassador to Britain Fu Ying ran her leg in Chinatown, who was a hot topic of British media over whether she would be a torchbearer. "It's a great day for both London and Beijing. The two cities meet each other today," said Fu. "I hope the Olympic flame can splash peace, harmony and friendship to the world. I'm happy to see large groups of residents give their warm welcome to the flame's arrival including the elderly and the young. "It's really a great pleasure to see Londoners smiling and waving." Tens of thousands of spectators went to the street of Paris to watch the torch relay, which covers 28 kilometers starting the Eiffel Tower and ending at the Stade (Stadium) Charlety in the south of the city. 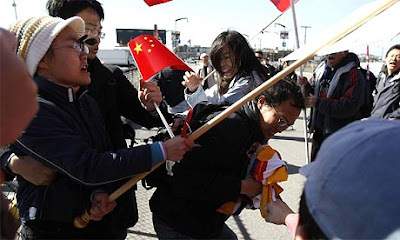 Many on-lookers waved Chinese flags to cheer the event or put flag stickers on the face. One of them told Xinhua that some of the flags were hand-made by themselves or posted by their friends in China. The torch relay resumed on ground at around 2 p.m. (1200 GMT) on Monday after the torch was twice put onto bus earlier for technical reasons, a Xinhua photographer following the torch relay witnessed. 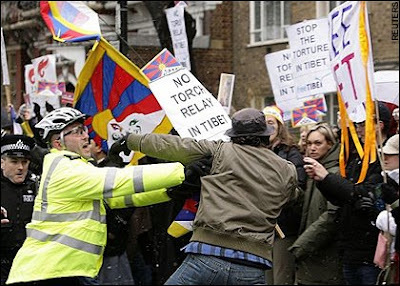 Spectators of the Beijing Olympic torch relay were greatly annoyed and angered by Tibetan separatists and their supporters attempting to disrupt the Monday event in Paris, the fifth leg of the flame's global tour. "We've come here only to watch the torch relay," said a Paris student, who gave his first name as Mark. "What in the world does this have anything to do with us except for annoying us?" 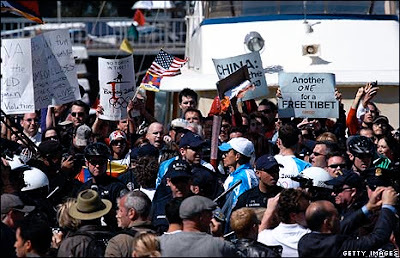 he added, pointing to Tibetan separatist demonstrators. Foreign media reports saying the Olympic torch was forced to be extinguished during the relay in Paris were false, Chinese Foreign Ministry spokesperson Jiang Yu said early Tuesday morning. 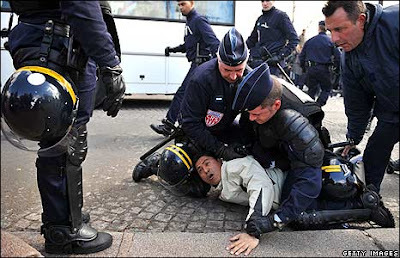 The modes of the relay in Paris were temporarily changed to safeguard the security and dignity of the Olympic torch under the circumstances there, Jiang said in a statement released by the ministry. 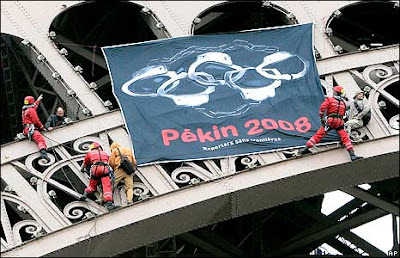 "The reports by foreign media are false in claiming that the Olympic torch was forced to be extinguished during its relay in Paris," said Jiang. As the Olympic torch has traveled to San Francisco, the city is extending its arms to embrace the flame with pride, emotions and courage. Despite criticism for giving the green light to the Olympic torch relay, San Francisco mayor Garvin Newsom said the city takes great pride in hosting the great event. "The Olympic torch represents the journey for excellence, and we are honored to have the opportunity to host and contribute to the Beijing Olympic Journey of Harmony," Newsom said in an interview with Xinhua days before the torch relay. The city is the torch's only stop in the continent as part of its worldwide relay, called "Journey of Harmony". With iconic landmarks like the Golden Gate Bridge, the Transamerican Building and the famous Victorian houses, San Francisco is an ideal backdrop as the world looks on to the extraordinary event, according to the mayor. The relay ran for two and half hours along the San Francisco area with the closing ceremony held at the airport. Thousands of people gathered along the route of the relay under a sunny sky to show their support for the torch run in the U.S. city, which is the sixth leg of the torch's global journey. Chinese Ambassador to the United States Zhou Wenzhong said on Wednesday that the Olympic torch relay in San Francisco was "successful" under enthusiastic reception of the American public, including the Chinese Americans and overseas Chinese. "The Olympics belongs to all, and the Olympic torch carries and passes around the Olympic spirit and advocates peace, friendship, harmony and cooperation," the ambassador said in a statement. Love it! You can help but smile at the absurdity of the state-owned chinese media. Many thanks for this conjunction Heresiarch - well done, says it all really. All original material, design © 2007-2013 Heresy Corner, all rights reserved. Confined by Lucifer to one of the lower circles of Hell, the Heresiarch nevertheless continues to campaign against all forms of orthodoxy. "One of the best blogs on the internet"
"Intelligent, well-argued posts that tackle lazy thinking wherever it’s found." "The best writer in the UK blogosphere?" Original material, header and unique template elements © 2007-2010 Heresy Corner, all rights reserved. In the case of guest posts, copyright remains with the original author. Articles may not be republished in full or in bulk without permission. Limited extracts may be quoted with attribution and link.